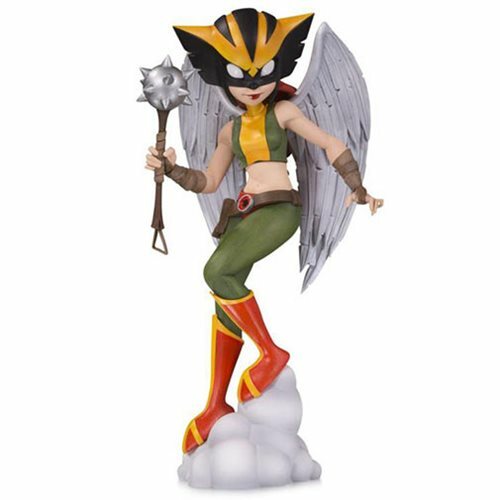 As she flies through the air, lifted by her great wings, Hawkgirl dispenses sweet Thanagarian justice on those who would do harm to the innocent. This 7-inch tall designer vinyl figure is a limited edition of 3,000 pieces so be at the ready to get yours when it arrives. The DC Artists Alley is a stylized collection based on designs from some of today's cutting-edge artists. Channeling the comic convention experience, DC Artists Alley brings unique, artistic viewpoints to the DC Universe through highly-detailed, limited-edition designer vinyl. To fully match the Artist Alley origins of the figures, the box includes a print featuring the original artwork the figure is based on. Designed by Chrissie Zullo; Sculpted by Irene Matar.